Looking for facts on wind energy? If so, look no further. This article features 20 interesting wind energy facts – some of which may surprise you. As the world looks to cleaner and greener energy solutions, we are likely to see a further increase in the use of the wind as an energy source. Wind energy is the energy we can obtain from harnessing the wind. The wind blows as a result of atmospheric pressure differences. During this process, air moves from areas of high pressure to areas of low pressure. This causes gusts of winds at different speeds depending on the conditions. We can harness wind energy through different means. Humans have made use of the wind for generations via the use of windmills. These were traditionally used for processing grain and pumping water. Nowadays, you are more likely to find a wind turbine harnessing the wind in order to produce electricity. Other uses of wind energy can be found in recreational activities such as windsurfing and kitesurfing. Although nobody knows exactly when the first windmill was built, history tells us that the Persians made use of this technology as far back as 500 to 900 AD. By the 14th Century, windmills had become popular in Europe. Daniel Halladay is credited as having invented the American windmill (or wind engine) in 1854. This was a self-regulating wind pump, mostly used for lifting water from wells. The first electricity generating wind turbine was invented in 1887 by James Blyth in Glasgow, Scotland. He designed and built a cloth-sailed wind turbine to charge accumulators at his holiday cottage. He was then able to use this electricity to power the lights within the building. A year later in 1888, the American Charles F. Brush invented the world’s first automatically operated wind turbine generator. He built this at his mansion in Cleveland, Ohio and used the electricity to charge 12 batteries in his home. 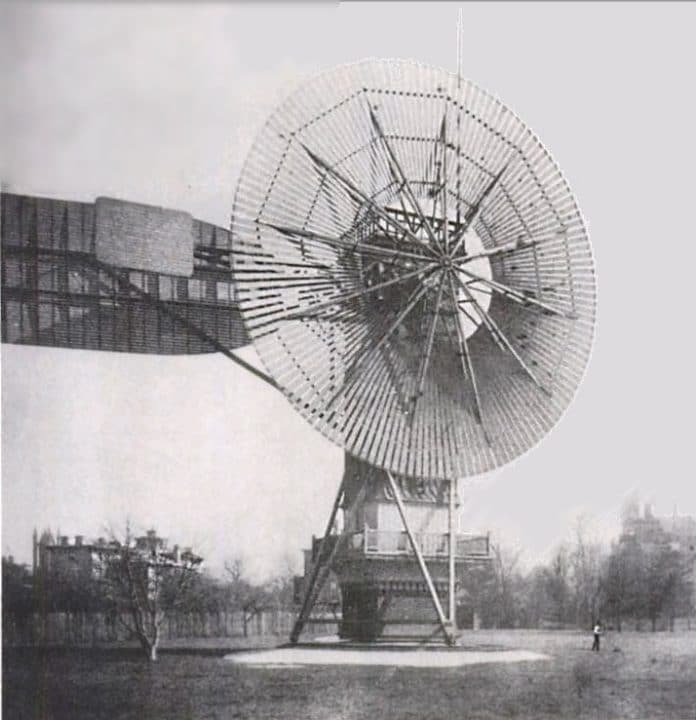 The world’s first automatically operated wind turbine generator invented by Charles F. Brush in 1888. Wind energy is a very clean and environmentally way of generating electricity. It produces no greenhouse gases unlike many traditional energy sources that use fossil fuels. It is also completely renewable and will never run out. This makes it an ideal alternative to non-renewable resources which will one day run out. We use the term ‘wind farm’ to refer to a large group of wind turbines. These are often found in exposed areas where wind power is a commercially viable option for electricity production. Wind farms can be placed either on land or out at sea. This differentiates wind power over many other renewable energy technologies. It allows coastal countries to benefit from both onshore and offshore locations that may be suitable for wind energy production. According to a 2018 report from the International Renewable Energy Agency (IRENA), Europe was the biggest producer of wind power for the year 2016 by continent. In that period, Europe produced 306,340 GWh of wind power. Asia came in a close second with a production total of 294,506 GWh. 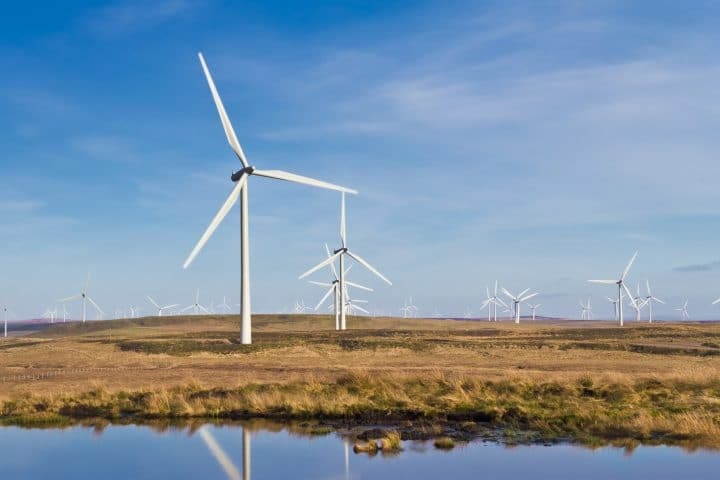 Whitelee wind farm in Scotland – the UK’s largest wind farm and the second largest in Europe. Based on the same data from IRENA, China was the biggest producer of wind power in 2016 by country. China produced 242,388 GWh of wind power in that period with the United States coming in a close second producing 229,471 GWh. With wind energy one of the fastest growing global energy sources, these figures are likely to change in the coming years. Number 10 in our list of wind energy facts also relates to 2018’s data from IRENA. According to this data, the world generated a total 957,938 GWh of wind power for the year 2016. This was a 15.75% increase over the same data for 2015. These figures show how popular wind energy is becoming in many parts of the world. The two most common types of wind turbine are the horizontal and vertical axis wind turbines. Horizontal turbines are the most popular of the two and feature a long tower with the turbine and rotor at the top. Vertical axis wind turbines feature a shaft with vertically positioned blades attached. In this type of design, the turbine is usually found at the base. Depending on the design, size, placement and actual wind speed, wind turbines can spin as fast as 180 mph. This is based on the speed at which the tips of the blades can turn. Advancements in wind power technology are likely to only keep increasing the rate at which wind turbine blades can rotate. As of 2018, the largest wind turbine in the world is the MHI Vestas turbine which can be found off the North East coast of Scotland. This turbine has a whopping 8.8 MW capacity but is soon to be superseded! 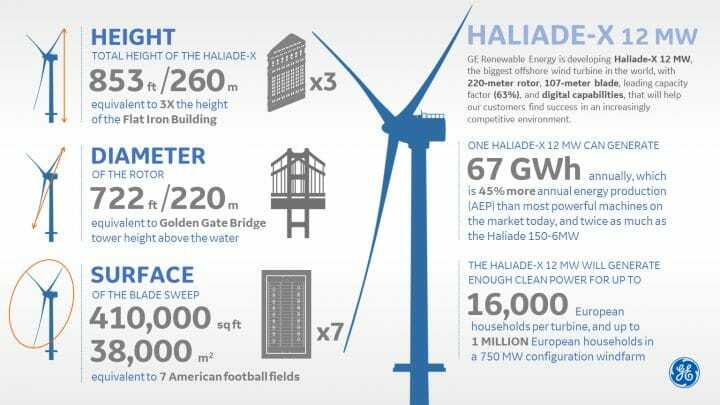 In 2019, GE has announced plans to build the world’s largest wind turbine (the Haliade-X) outside the city of Rotterdam, Netherlands. This turbine will have a diameter of 220 meters and will span 260 meters from its base to the tips. It is said that the turbine will be able to produce 12 MW of electricity. Haliade-X infographic. Photo credit: GE Renewable Energy. Modern wind turbines like the upcoming Haliade-X are said to be able to power approximately 16,000 homes. This is an impressive figure when compared to some of the smaller turbines that exist in many wind farms across the globe. Wind power isn’t limited to large scale wind farms or commercial installations. Smaller wind turbines are available which are suitable for residential customers. These are mainly found at residences with significant land such as farms and large estates. A small turbine can also be beneficial for business owners looking to generate power for a warehouse, factory, or office building. Due to advancements in wind energy technologies, a global industry of manufacturers, installers and producers has been created. This has fuelled job growth in many parts of the world with everything from design careers through to engineering jobs available. This fact of wind energy is highlighted by the recent increases in global wind energy production. The 15.75% increase in wind energy production between 2015 and 2016 shows how wind power is expanding right across the world. A standard horizontal wind turbine has many different components. The key components are the tower that supports the housing, the blades that turn a drive shaft, a gearbox that transfers power to the high-speed shaft which then turns the generator to produce electricity. 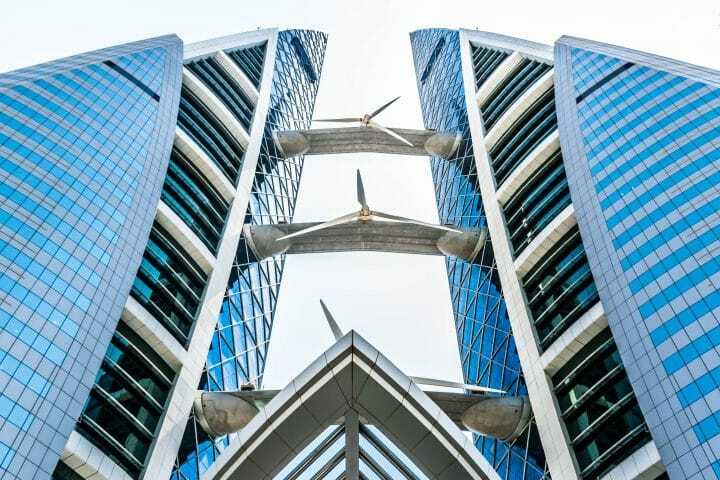 Architects of buildings such as the World Trade Center in Bahrain have managed to incorporate wind turbines into their design. This not only helps to provide a source of clean and renewable electricity, but it can also increase the aesthetics of a building. Wind turbines incorporated into the architecture of Bahrain’s World Trade Center. Last up in our list of wind energy facts is that wind energy does not consume water, unlike many traditional sources of power. Even some renewable energy technologies require water to function correctly. For instance, solar panels require periodic cleaning to ensure peak efficiency. Power stations consuming oil, coal, and gas are heavy users of water, making wind turbines a far better alternative. Water is a valuable resource that we should conserve as demand for it rises.